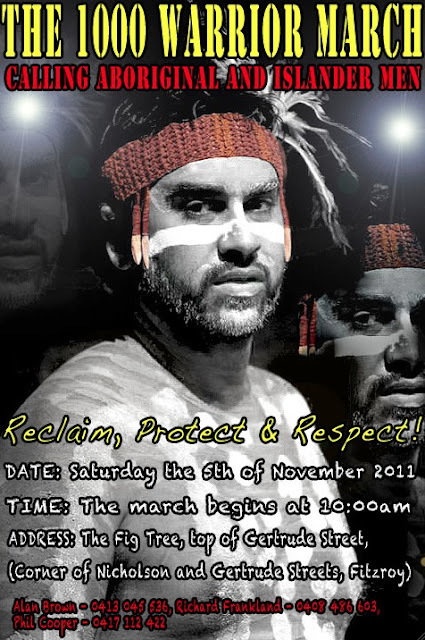 On Saturday the 5th of November, Aboriginal and Islander men will March to Reclaim, Respect & Protect. The purpose of this email is to provide full details of the March and its intended purpose. * To reinforce our place in family and community. * To reinforce our culture as a way forward. * To show we are role models for our families and our young. * To make a stand for healing our country. * To commit to the rights of Aboriginal people. * To pledge to honour the 1000 warrior values. Aboriginal and Islander men will be participating in the March and they will March through Melbourne in harmony to Reclaim, Respect and Protect. The men will then meet their families, friends and loved ones at Birrarung Marr (back of Federation Square) to celebrate. We look forward to seeing all Aboriginal and Islander men on Saturday the 5th of November.